Complexion MD Anti Wrinkle Cream, US $99.95 is a multi-tasking anti-aging cream that claims to improve the appearance of wrinkles, fine lines, and other visible signs of aging skin. Complexion MD – Does It Really Work? What are the Ingredients in Complexion MD? Does Complexion MD Have Any Side Effects? This product has been reported to be formerly known as Replexion. Based on the Better Business Bureau, this product is being manufactured by Advanced Nutraceuticals, LLC based in Dania, Florida. Other than that, there is no other information available about this product’s makers, not even its track record in formulating quality skin care products. This product works by delivering 3 peptides as its top ingredients, all promoting better skin health and improved appearance of wrinkles and other signs of skin aging. Encourage deep and intense hydration that brings back the life to your otherwise dull skin. Smoothen wrinkles and fine lines by relaxing your facial muscles. Encourage faster skin healing and repairs. Hyaluronic Acid: Significantly improves your skin’s moisture content. However it may cause allergic reactions. Retinyl Palmitate: A more stable Vitamin A derivative, it delivers anti-aging benefits by encouraging the elimination of your skin’s surface layer while skin regeneration and turnover are hastened to surface new skin. Shea Butter: Delivers a soothing and conditioning sensation that relieves your skin from uncomfortable dryness. Aloe: Supports skin healing by revitalizing your skin’s natural repair and rejuvenating mechanism. This product is easy to use and hassle-free to incorporate into your existing regimen.However, according to customer reviews, it isn’t very effective. This product is available from various affiliate marketing websites, as well as from re-seller sites at a wide range of prices for the same formula, and therefore no standard product pricing is in effect. There’s danger that this product may be purchased from unauthorized re-sellers, therefore increasing the risk of buying forfeited goods. Based on this product’s primary ingredients (listed above), skin irritation and allergic reactions are possible, most especially concerning Retinyl Palmitate. This ingredient also increases your skin’s risk for UV damage. Other side effects from product use cannot be assessed further without the full product ingredients list. In which case, you are advised to take extra precaution when using this product for the first time. Complexion MD Anti Wrinkle Cream must be generously applied on the face, neck and chest after fresh cleansing and toning your skin. Always layer with sunscreen in the morning to keep your skin protected from further damage caused by UV. 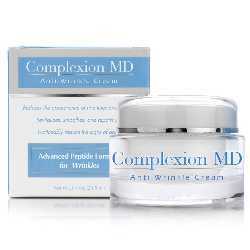 Complexion MD Anti Wrinkle Cream may have the anti-aging agents your skin needs to stay young. However, varying information being shared by third parties are variable, even in terms of price and composition. When you’re serious about skin care, you do have every tight to be meticulous of what’s going onto your skin. Take a note that there’s no Return policy mentioned on its official website.